Today we're critiquing the blog, Skip to My Lou. Since early 2007, blogger Cindy has been sharing her ideas for crafts, family celebrations, and memory-making. Do you find the site attractive and professional looking? Can you think of something you would like to see on Skip to my Lou? Would you visit again? Why/Why not? What would bring you back again and again to Skip to my Lou? While the site has good traffic (over 2,000 hits per day) there not a large commenting community? What makes you want to leave a comment? Do you see this as a problem? Do you find the ads bothersome? Would you click on the ads? Would you be willing to pay $0.99 to download some of the patterns and templates. What is the most you would pay? Would you rather subscribe and pay a monthly/yearly fee to access all downloads? I would also love to hear your overall impression of my blog. 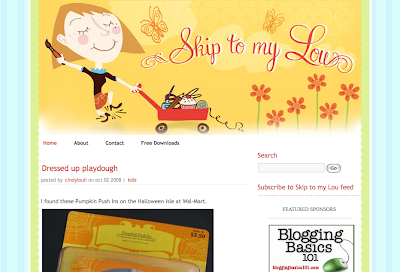 Lay it one me, I am ready to move to the next level and would love to hear some constructive criticism to make Skip to my Lou the place you go to for inspiration, craft ideas, recipes, fun activities, sewing tutorials and holiday celebration ideas. Do you like giveaways? Which products are most enticing? BlogCoach readers, take a look and let Cindy know what you think!